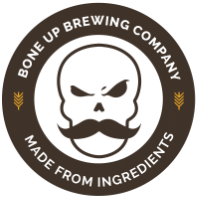 Stats: Ghost Dragon - Bone Up Brewing Co.
Best Occasion to Drink: whilst yelling at the rain. Brewers' Notes: No, YOU chose a hop bill just because it let you make a beer with a cool name. Brewed with real ghosts and dragons! Oh, and some Grungeist and Styrian Dragon hops generously provided by our pals at Hop Head Farms!